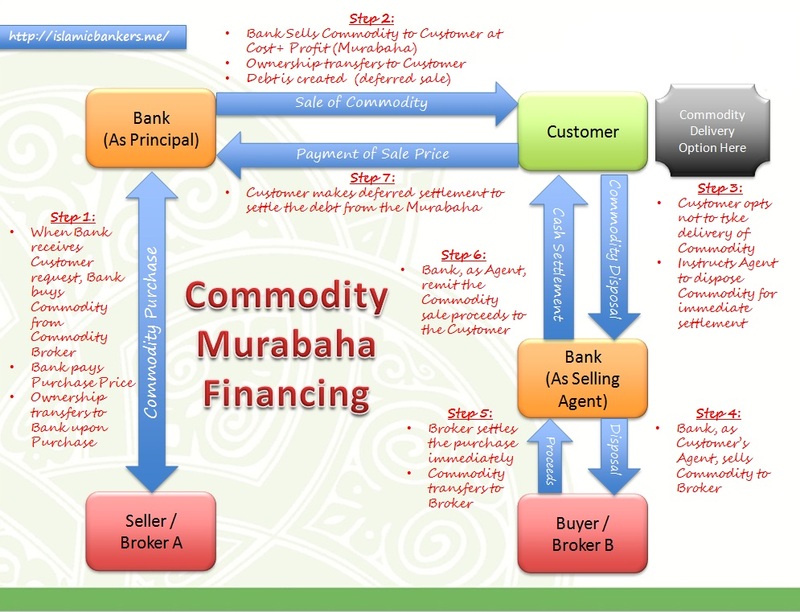 Banks that will introduce a totally new structure to the Mudharaba deposit customers, such as Tawarruq deposit or something fantastical. The push by Bank Negara Malaysia (BNM) is really quite clear; Mudharaba as the flagship product that introduces the customers to the world of risk-taking and therefore, potentially higher returns. And if the Mudharaba is to be classified as an Investment Account, then it should behave as one. But in all honesty, Mudharaba has always been an “investment or entrepreneurial” contract. Worldwide, the concept of Mudharaba means; take customers funds and enter into an investment and share the profits (if any) and should there be a loss, the customer will take that capital losses. 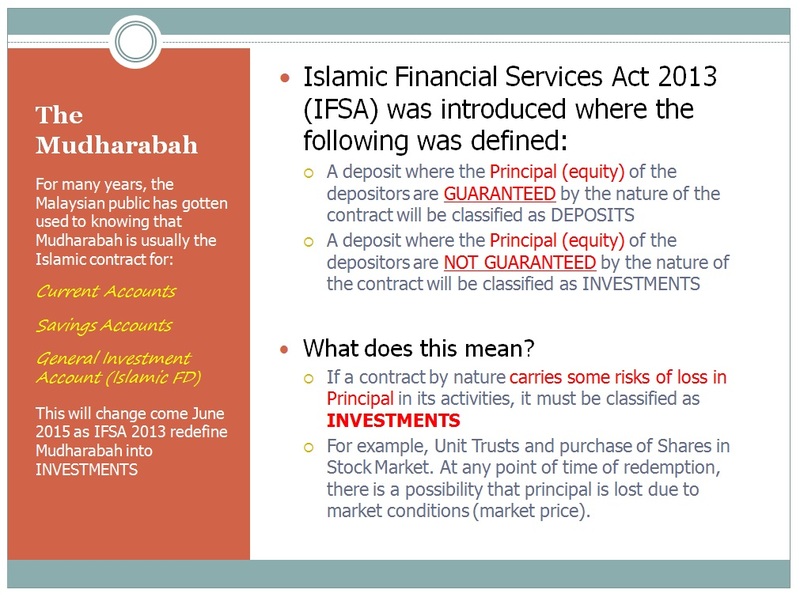 This definition does not change, post-June 2015 when the IFSA for deposit comes into effect. What has changed is that Mudharaba will now be classified as Investments, instead of investments that behaves like a Deposit. There is no fundamental difference between the “now” Mudharaba and “future” Mudharaba. The clause where the capital investment of the Mudharaba is open to potential losses has always been there. The terms and condition contains this. But due to the classification of Mudharaba as Investments post-June 2015, the treatment on how a Mudharaba Investment is processes, managed and executed now changes. Bank distributed the profit to the customer, based on the individual Profit Sharing Ratio. Customer comes in as an Investor, and must come with their eyes wide open. They will see the historical returns on the investments. Customer will also be informed of where their Investments are being invested into and the risks and potential future rewards of the investment. Both for worse case and best case scenario of the investment. This includes the part where the risks to their capital must be clearly be made known to them. Customer understands the risk and is evaluated via the Investment Suitability Assessment. A risk grading is assigned and the customer is presented by a list of Investment that their risk grading qualifies for. Customer, with all the information available to him, makes his own decision to either enter into a Mudharaba Investment contract for the “right” Investment, decline it, or chose to undertake a higher risk profile Investment with the indemnity to the Bank. Bank takes the customer on as an Investor, and invest the funds into the “specific” Investment Asset (This makes the Bank sound like it is now a Fund Management company!!!). The Bank now manages the funds as a Specific Investment pool. If re-allocation of asset in this pool is required, the Bank is to inform the investor of the change in the portfolio. At a determined period, or maturity, the Bank calculates and accrues the “distributable” profit to the customer. If the Asset is an external investment, there will be a “market value” to be calculated (Mark-To-Market) and any early redemption may result in loss of capital/equity. In some cases, profit needs to be “realised” to be “distributable”. Bank distributes the actual realised (or accrued) profit, if any, to the customer based on the individual Profit Sharing Ratio. The investment is either divested based on prevailing market value, or re-invested into a new tenure with new investment terms or parameters. So you see, the Mudharaba now is defined closely into what a real investment is; capital not guaranteed, returns based on risks, and real valuation. Some will even carry redemption risks i.e. loss of capital if redeemed before maturity. Therefore, even for a basic Current Account or Savings Account, once it is converted into an Investment Account, carries some degree of risks post-June 2015. For one, the PIDM cover will no longer include Investment-type of accounts, and while there are questions of its applicability in its current state, the comfort of such cover is now lost to the daily consumers. Having said that, ideally the Banks should reinforce the idea that with higher risk there should be higher returns. 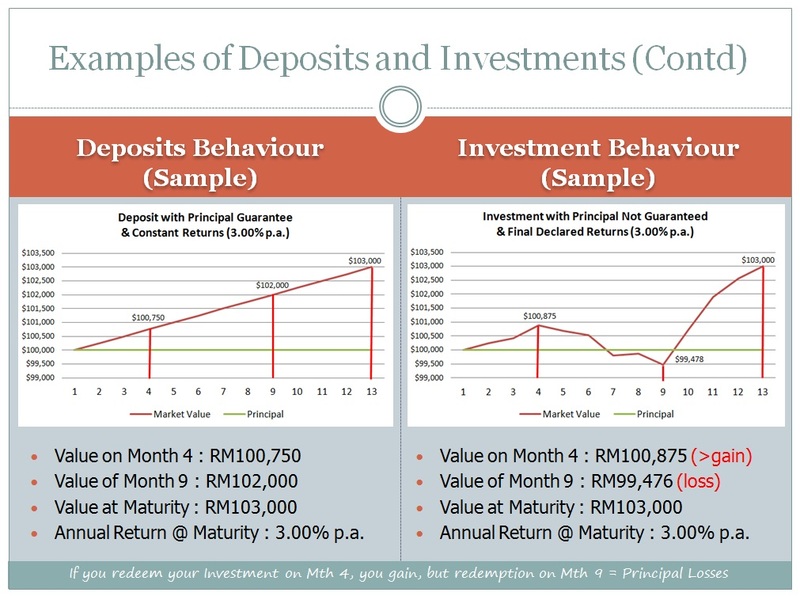 Living in the old thinking that Investment Accounts are the same as Deposits Account (Savings or Current Account) will only result in a disconnect to what BNM is trying to do. 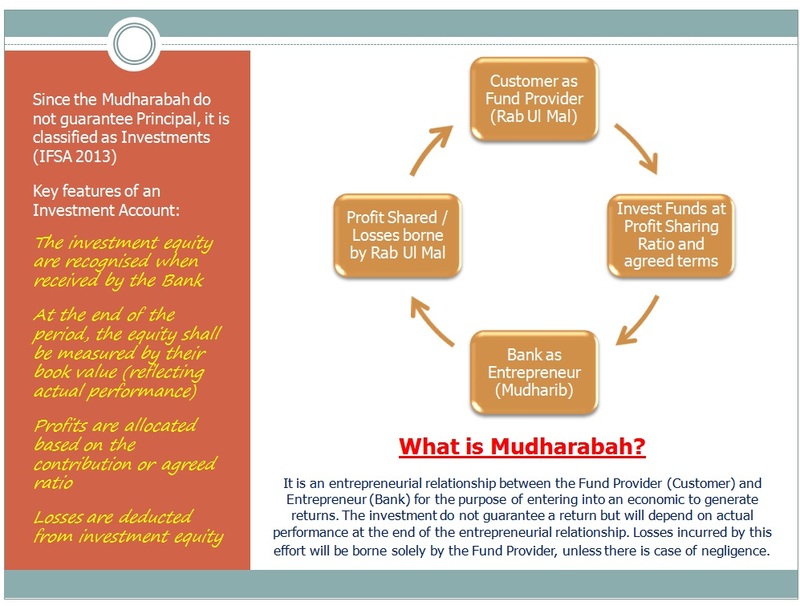 The idea of Investment Account is not only limited to Mudharaba-type of contracts. Any contracts that carries an element of risks to the customer’s capital will be classified as Investments. The on-boarding treatment of customers into these contracts will be the same; The risks of the investment must be made known to the customer, customers must be assessed to identify the risk profile, customers must make their own decision on the risks that they are willing to take, and enter as a real investor taking real market risks. Such contracts will include Wakala Fi Isthihmar (Investment Agent) or Musyaraka (Partnership). 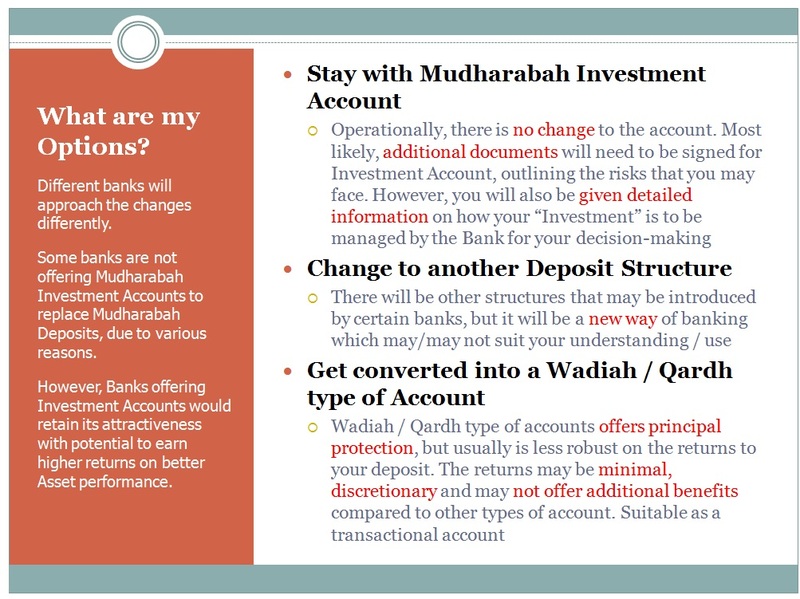 As a summary, what will happen in 2015 once your Mudharaba-type of account (Savings or Current Account) be converted into an Investment Account? Yes some change will happen, and Banks will be looking to seek customers consent whether to allow the conversion into an Investment-type of account, with the additional disclosures and risk warning statements, or to convert the account into a deposit type of account. As I see it from the Bank’s perspective, the management of the funds in the account remains largely the same, with greater level of transparency needed in terms of where the customers funds are invested into (the Investment Assets), the management of returns and valuation of the assets on maturity or early redemption. Sounds complicated, but really it is not. It is business as usual for the Banks, with some additional reporting, management and compliance requirement to adhere to. Personally, when the Mudharaba account migrates, I do not foresee a significant increase in risks to the customer capital (as it will still be managed similarly as before) and no significant increase (or decrease) in returns on their “investments”. 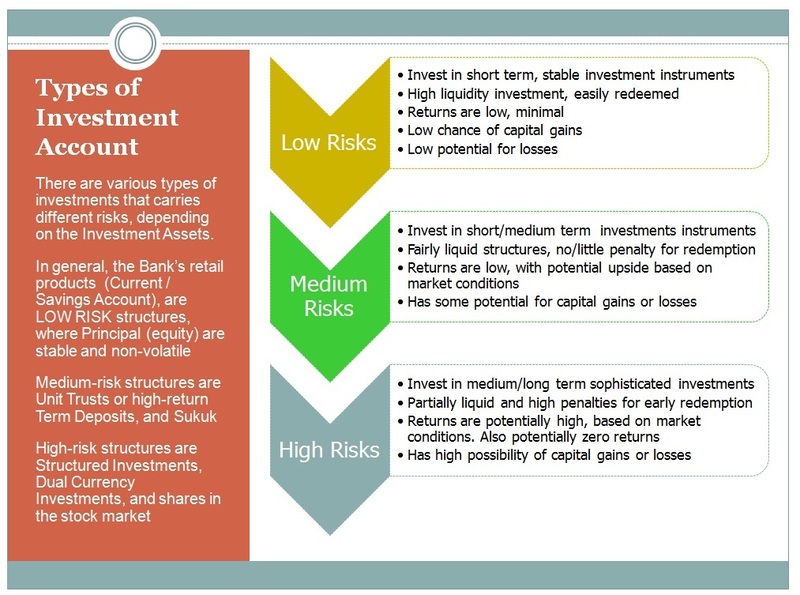 If the Bank keeps the Investment Assets as “low risk”, there should not be any concerns to the average customers. There will be other options available to the average investor, but the purpose of this post is to highlight to the existing “investors” that there is no panic button to be pressed. There will be a period of awareness building (reinforcement, more likely) on what “future” Mudharaba is all about, in the stricter understanding of its investment nature. But all this while, the Mudharaba structure is already being managed as an “Investment” via the General Investment pool. The investment risks have always been there, but because the pool has been managed properly and successfully by Banks, it has become Urf’ (customary) to the customer to believe that capital is protected (when actually it should not). It really is not, as Mudharaba is always an Investment arrangement, and is reflected even in existing documentation and product terms & conditions. Now it may look like it is going to be a different animal in June 2015, however if you take a step back, it is actually an increase in disclosures to the customer on the product features; nothing more. Internal banking processes will be adjusted and enhanced to meet the additional disclosure requirements. Investment Accounts may seems like a huge change, but it is actually a refinement of the contract requirements. It provides greater transparency to customers, and enhance their involvement in the product by understanding the risks undertaken. The definition of Investment Account has already been captured in organisations such as AAOIFI, where Investment Account and its treatment are defined. BNM is now taking steps in the same direction. 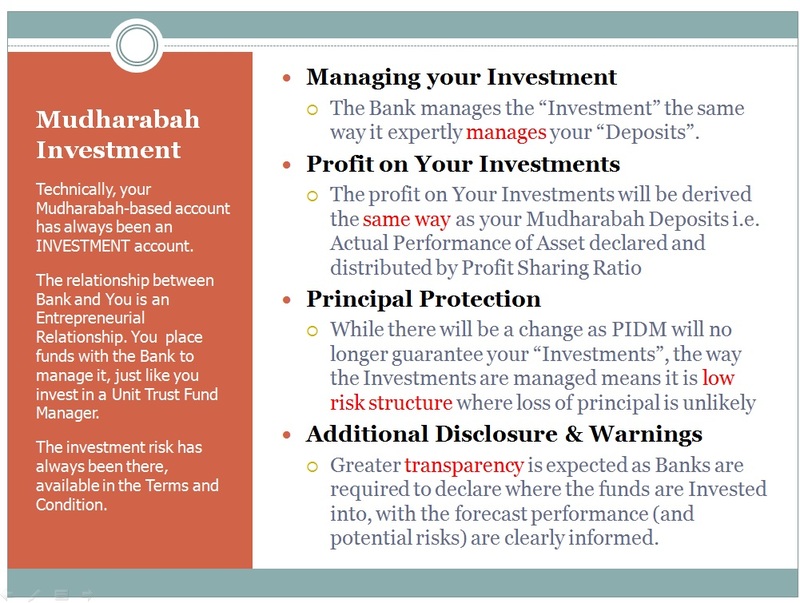 Investment Accounts may change the way you bank at the moment, but it really is a similar proposition to the Mudharaba Deposit account with eventually greater transparency and disclosure. We look forward to welcoming Investment Accounts into our midst of products available. 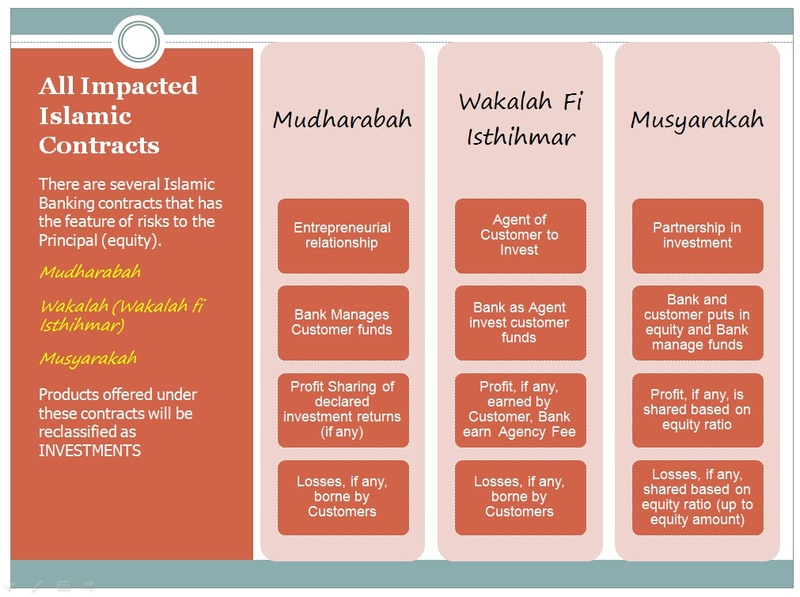 Why Choose Islamic Home Financing in Malaysia? E-Wallets : Did You Forget Us Again? Muhsin Nor Paizin on E-Wallets : Did You Forget Us Again? Hans on Why Choose Islamic Home Financing in Malaysia? Amir Alfatakh on Why Choose Islamic Home Financing in Malaysia?